Tequila that is made exclusively from sugars of the "Agave Tequilana Weber, variedad Azul" (Agave Tequilana Weber, blue variety). Premium tequilas are made with "100% de Agave," and can only be bottled in Mexico, not bulk-shipped for bottling outside of Mexico. 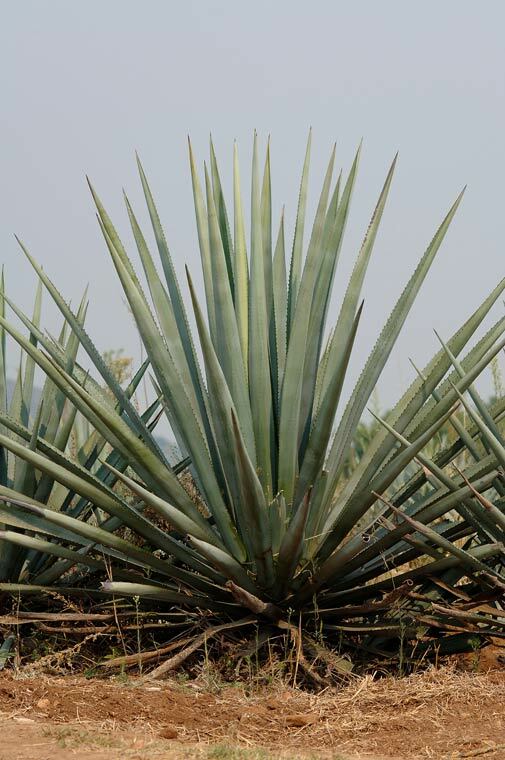 100% de Agave is one of the two official categories of tequila. The other category is "mixto". This product must be labeled using one of the following statements: “100% de agave,” “100% puro de agave,” “100% agave,” or “100% puro agave,” to which the word “azul” [“blue”] may be added. Tequila that has not been aged in wood. After the tequila is distilled some producers allow it to settle and finish for a few weeks in the tanks before bottling. These tequilas are often called suave, joven, gold, or abocado, implying youth and smoothness. This procedure is used to soften the flavor of tequila, generally by the addition of one or more of the following - caramel color, natural extract of oak and encino, glycerin, sugar syrup. The amounts of these ingredients should not exceed 1% of the total weight of tequila before being bottled, and the resulting coloration must be yellowish. Long-necked tool (traditionally a gourd) for siphoning aguamiel from scooped out section of maguey, to make pulque. Land preparation - to gather the dried undergrowth into small piles along the furrows to be burned after clearing. is used to cook agave. A plant that belongs to the amaryllis family. A distant relative of the lily, but not in the cactus family. Agave plants are succulents with spiny, blue-green green leaves that grow out of a pineapple shaped base that take 8 to 12 years to mature. Agave is poisonous when raw, but has a sweet, mild flavor when baked or made into a syrup. There are over 300 varieties, but only the blue agave (agave tequilana weber azul), cultivated primarily in the state of Jalisco, is used to make tequila. Because of the shape of the agave leaves are similar to the outstretched fingers of a human hand, prehispanic Mexican Indians called the plant "maitl" or "metl" which means "hand." A prehistoric plant related to the lily. The blue agave plant takes up to 10 years to mature properly and yields a pineapple-type heart, the piña. By law, blue agave (agave tequilana weber azul) plants can only be grown and harvested in the Mexican states of Jalisco, Guanajuato, Michoacan, Nayarit and Tamaulipas. Also by law, all Tequila must be produced from no less than 51 percent of reduced sugars from the blue agave, with the remaining content from other natural sugars. Tequilas containing more of the blue agave sugars are not necessarily better Tequilas, they simply have a more pronounced agave taste. The ranchers in Baja California prepare their regional beverage with this small agave plant whose leaves barely reach 30 centimeters in length. The ripening takes between eight and 12 years. Used to make bacanora, the regional mezcal of Sonora. The only variety of agave allowed for use in tequila, and only when grown in specified regions according to the normas. It has long, rigid leafs and is a glaucuos blue. An agave farmer. Ålso the name of a tequila liquor (Agavero), a blend of 100% blue agave tequilas and an extract of the Damiana flower that creates a flavorful liquor. Tequila suelto - Bulk tequila - tequila without a name or NOM. Legally not tequila. Generally this is an agave spirit that is produced for agave farmers at a registered tequila fabrica acting as a maquila. This tequila is stored, usually in oak barrels, and sold by the cup, glass, liter or gallon. Usually made from 100% agave. This product is produced without the supervision and regulation of the CRT and cannot legally be called tequila. Tequila A Granel is also tequila that is produced by one registered distillery and sold to another registered distillery under the supervision of the CRT. This term may also refer to low-quality mezcal or tequila, usually only distilled once, sometimes fermented with the help of chemicals. The name literally means “honey water”and is the sweet sap extracted from the piña (heart) of the agave plant, the basic building block for making tequila. It is obtained by pressing the steamed piñas in a mill. This sugar can be extracted by repeatedly washing the plant’s crushed fibers. If done properly, 98 percent of the agave’s sugars can be extracted. It is fermented for several days and then distilled to make tequila and mezcal, or fermented alone to make pulque. Agave Nectar or Agave Syrup can also be made from this sweet liquid. Spirit or liquor, usually made from cane sugars. Reducing the new leaf growth on the agave plant when it begins to ripen. 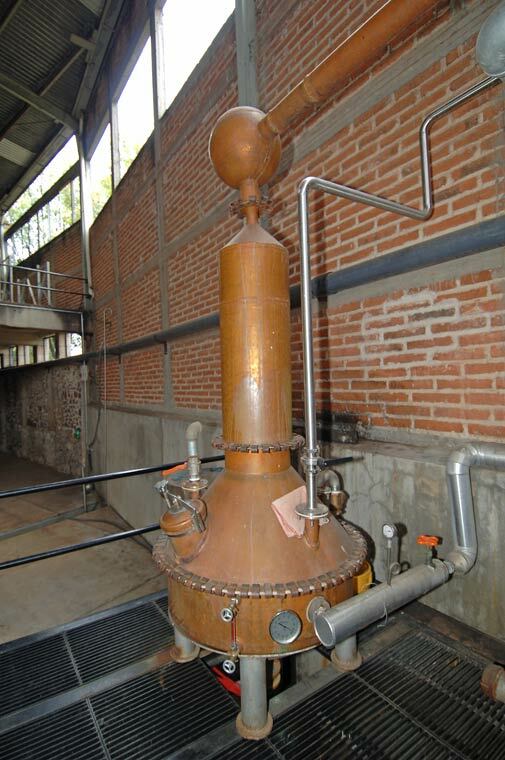 The traditional copper still used for the distillation of tequila. Also the name for the newer stainless steel tanks. 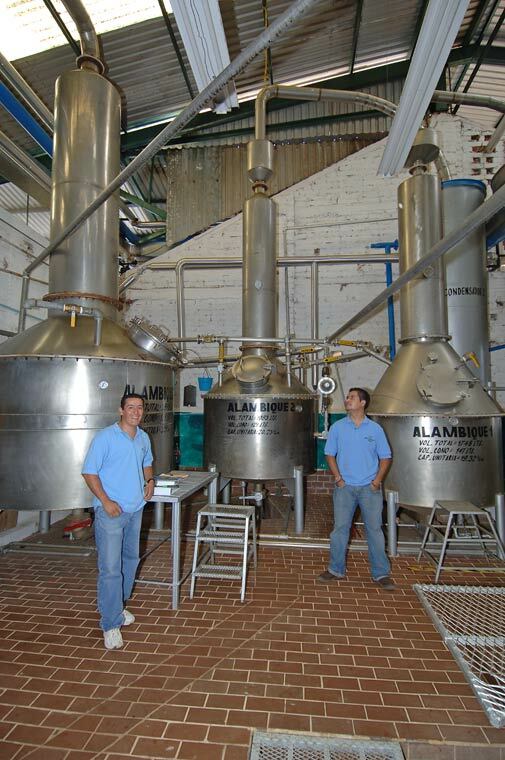 An alambique (still) is the apparatus for distillation of liquids through a process of evaporation by boiling and subsequent condensation by cooling. In order to receive the NOM mark, all Tequilas must have natural ingredients, which may include other types of sugar beside agave that assist in creating the smoothness of the Tequila. Highlands of Jalisco, Jalisco Heights, the generic term for the uplands area of the state of Jalisco. The next level of aging is the anejo tequilas. Añejo, which means "old" or "mature", can only appear on bottles that contain tequila, aged in oak barrels having a maximum capacity of 600 liters, a minimum of one year. This is a requirement of the Mexican government. A year of resting in a cool bodega produces a smoother and more sophisticated taste. American whiskey barrels, french oak casks, or cognac barrels, are commonly used to age this tequila. Añejos are typically aged between one and six years. They are darker in color, more complex in flavor, and smoother than reposado tequilas. This is the stage of growth when the maguey starts to ripen. Arandas, Jalisco - located in the eastern part of the state of Jalisco, Arandas is one of the specific regions of Mexico where tequila can be produced and distilled. A pressure cooker. 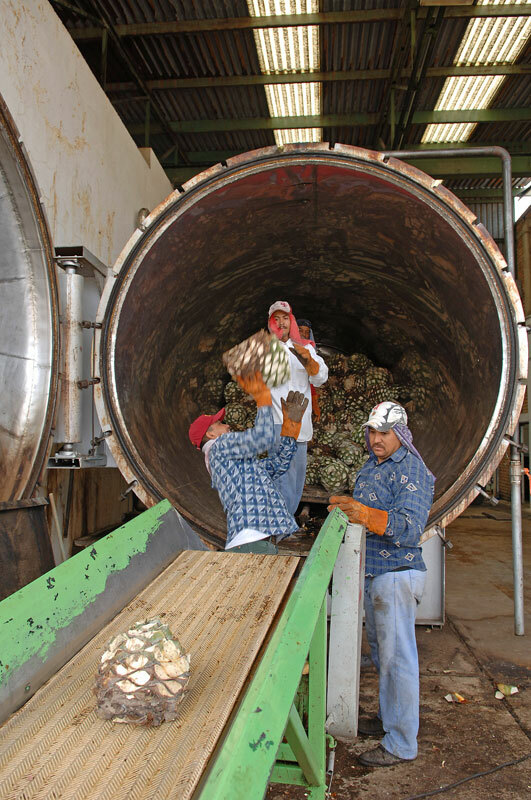 Large autoclaves are used by many producers because the steam speeds the cooking of piñas; the agave is cooked in a few hours instead of days as in the traditional brick hornos. If you choose to drink alcohol, please drink responsibly.